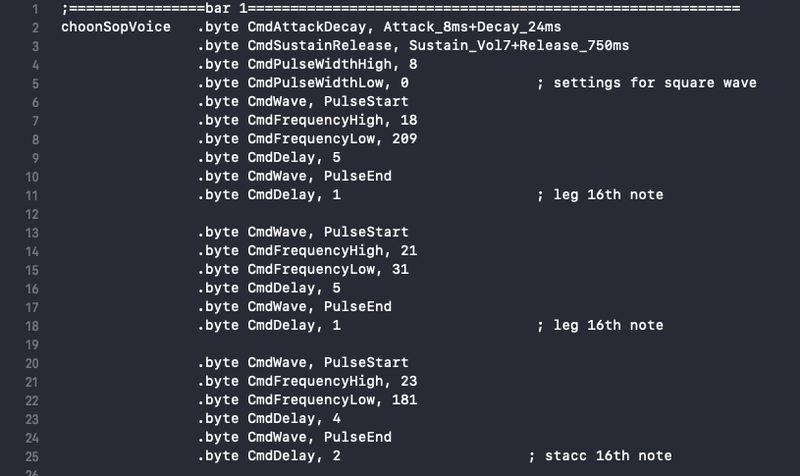 This post is going to combine musical notation, music XML, cocoa programming (objective-C for MacOS) and retro game programming (specifically the music) in assembly for C64. 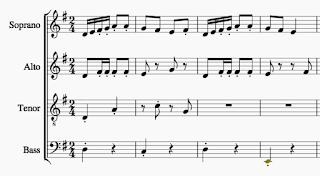 That might qualify this as an extremely niche post, so if you're reading because you're interested in all or some of those things, or if there's some other reason why you'd like to convert sheet music to another format, do let me know if the comments so that I know I'm not entirely alone! In the last couple of posts in this series I wrote about how I was tinkering around with a little tune for a game I'm writing for C64. Writing out the notation is something I'm very comfortable with. That looks pretty laborious to write out by hand, particularly looking up the high and low oscillator settings for each note. And I can tell you that it is. Anyway, for this game that's done now, I have something I'm pretty happy with, other than the voice settings. You can hear that in the last part of this series if you're interested. 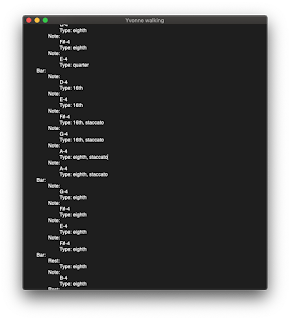 But with future composing efforts in mind, it occurred to me that I could seriously turbocharge this process, and pretty much generate the assembly language straight from the sheet music. 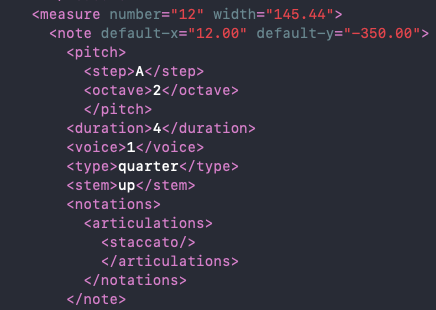 First step: parse the music XML (which any music notation software should be able to export to). At first, to save time, I downloaded an open-source class for turning XML into NSDictionary. That appeared to work but after some work I realised that it wasn't handling self-closing tags in the XML, which my musicXML was full of. So that wasn't a time-saver and to be fair the author of the xml -> NSDictionary class has made it clear that it's now out of date and unsupported. So back to square one and writing code using NSXMLParser. That involves writing a lot of code, but it's useful in some ways - it serialises the data, you can take what you want from it and ignore what you don't want. It was probably no more code than I had to write to extract the data after the XML had been converted to an NSDictionary, and there are no dependencies on 3rd party / open source code. 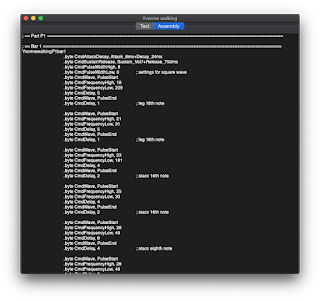 ... and here we are with the app now converting the notes to high and low frequency values and generating the assembly. Sweet! Yes I did have to type in the table of values for each note from good old Appendix E (just the decimal value, the high and low values are calculated from that) but now that I've done that, it's the last time I'll have to refer to that table. 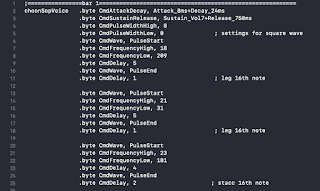 It looks like a lot of code, but each of those lines of assembly represents just two bytes in the compiled code, so my entire tune with three voices takes around 1.8k. 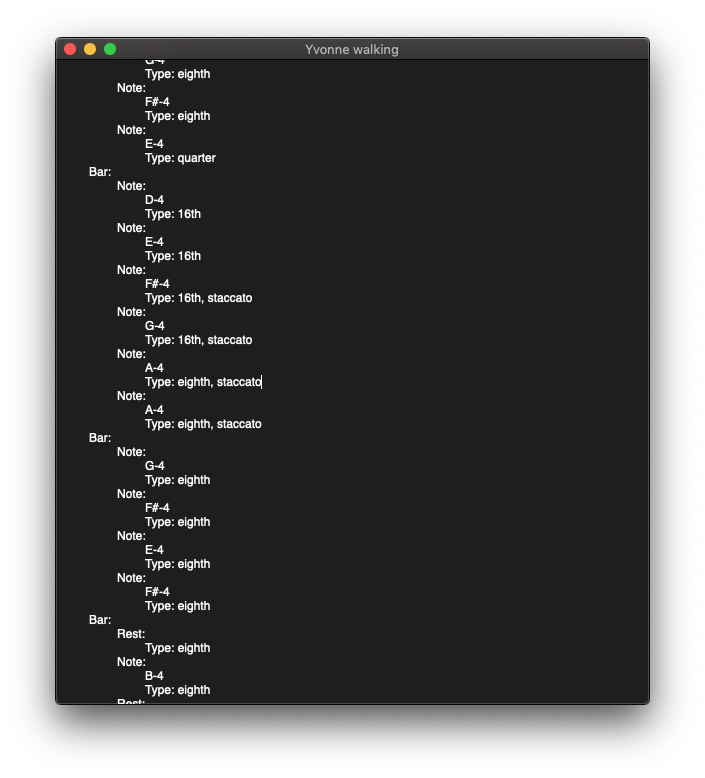 But I've been choosing to do other things such as the music and whilst doing that I got hung up on writing a system for converting music notation to assembly. 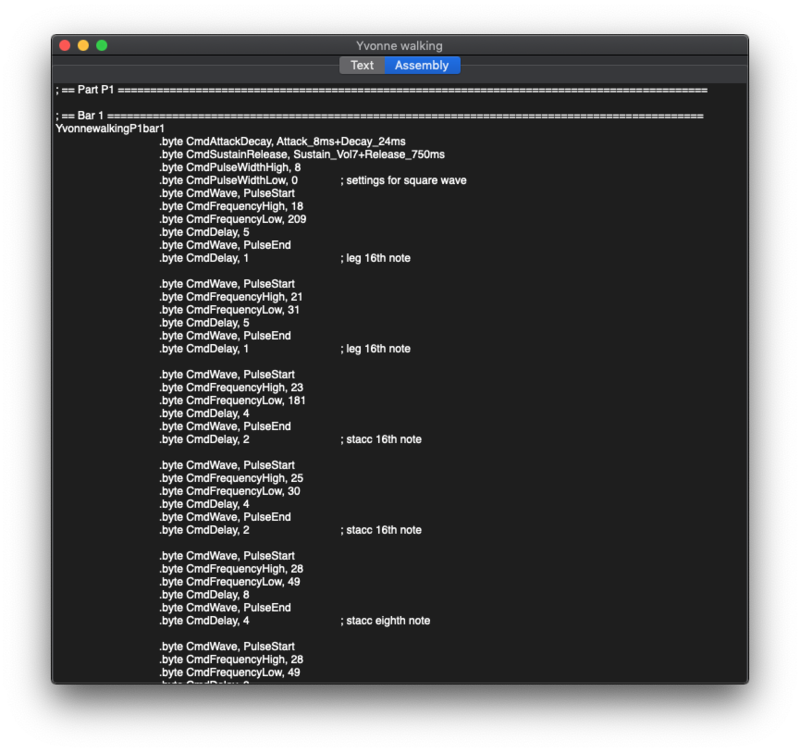 I've been muddling by with a miscellany of tools (TMPx, an online sprite editor, XCode etc). This has been working pretty efficiently, with a few frustrations. So today I decided to begin work on an IDE for Mac, which AFAIK doesn't exist. Not bad for a day's work. The syntax colouring alone makes the assembly so much easier to read. The line numbering probably took more time than the rest put together. You never know what's going to go smoothly and what you'll be stuck on for hours. It's funny how interests from your teens remain with you, how easy it is to pick them up again and how comfortable they feel. I'll probably write more about the revival of this hobby and my collection of 8-bit computers. Let's just say for now that I've begun a C64 puzzle game based on my character Yvonne the Sheep and her friends - and enemies. Writing for 6502 (or 6510 in this case, which makes no difference as far as the assembly language is concerned) is like putting on an old familiar comfortable jumper. I wasn't particularly keen on doing music, I did think about just forgetting it and just going with sound effects. But a silly tune came into my head that seemed suitable for sheep pootling around a field. I'm not a composer of any great experience but I am at home with sheet music. Notating it (in 3 voices and possibly a fourth later) was the easiest way for me to get the tune out of my head and onto 'paper'. Homebrew game for C64 - part 4: does it run on a real machine? This has been an amazing journey so far. I've worked entirely on my Mac and the Vice emulator while dusting off a real breadbin 64 and gathering the necessary adaptors and other hardware. Isn't this the cutest thing??! It's a SD2IEC from The Future Was 8-bit. Thank you to them for everything they do. I've got a version that should work with C64, Vic20, Plus4 and more. I didn't go for the preloaded card option, but it was very easy to grab a card, format it and load it with stuff. This was a very big moment. It's been weeks since I started this project, and for the first time here it is running on original hardware. The sheep look fantastic to me, cheap monitor aside (the characters are straight from my cartoon, Yvonne the Sheep). 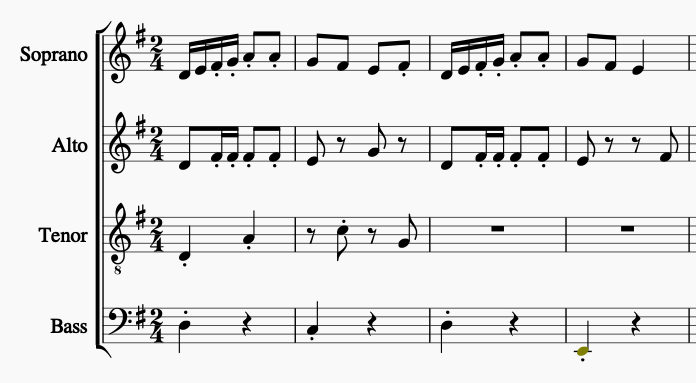 It's very early days as far as the gameplay goes, I've mostly been working on the tune recently and have built a system that allows me to pretty much import from sheet music.